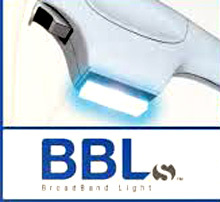 The use of Broad Band Light (BBL) therapy in the treatment of bruising has been used with variable amounts of success. (is the bruising resolution that occurs the result of the BBL treatment or just from the natural blood absorption process) Patients are understandably anxious about bruising, particularly in aesthetic facial surgery, so the desire to get to a faster resolution has clinical value. But treating bruising is unique amongst all ‘vascular lesions’ because it is the static accumulation of hemoglobin and does not represent dynamic blood flow. Bruising occurs as a result of blood (heme) getting outside of the blood vessels and residing within the extravascular tissues. This blood contains high levels of hemoglobin of which a major component is iron. (Fe++) Being a metal it is a natural heat sink and has a prolonged thermal relaxation time. Thus the use of BBL in bruising runs a higher risk of causing a burn injury to the skin than most other types of vascular lesion treatment. This understanding of the ‘target’ in Broad Band Light therapy becomes relevant when during treatment the provider tries to create a positive response by seeing the bruising get lighter. When this treatment approach is done for bruising the tissues at this point have likely sustained a partial or full thickness burn injury. This potential adverse effect is best illustrated in a case I saw recently from another doctor. After a rhinoplasty surgery the bruised under eye areas were treated during the first week after surgery by BBL for the bruising. Within days after the treatment it had become apparent that she had sustained full-thickness burn injuries to her lower eyelids. While it did eventually gone on to heal, she developed hypertrophic scarring on both lower eyelids from the secondary healing of her burn injury. The patient example illustrates that BBL heats the target (heme and the surrounding tissues) and when used without understanding the dynamics of the process can lead to irreversible complications. Thus for ‘ordinary’ bruising that is self-resolving I would be very cautious with applying BBL treatments particularly in thin tissues like the eyelids. Or at least turn the power down and do NOT look for a lightening effect at the time of treatment. For heme staining of the tissues that can occur long after the bruising should resolve is less risky where the iron content of the tissues is much lower. Higher BBL power setting can then be used more safely.